Part of 5 Question Friday is making people aware of things in Tacoma that they might not otherwise be aware of. The Tacoma Food Co-Op is one of those things. 1. What is the Tacoma Food Co-Op? The Tacoma Food Co-op is a member-owned store that specializes in food and products dedicated to sustainable, wholesome, lifestyles – including fresh, organic, GMO-free, allergen-free, and local. People shop at the co-op because it has foods that are selected for their values and ingredients, because the store engenders community, and because it is an experience that is personal and caring (for each shopper and for the planet). The Tacoma Food Co-op is owned and governed by its member-owners. People join the co-op to have a voice in the store’s governance and to better their local community. 2. How did you get started with the Co-Op? The co-op began with an idea: Tacoma needed better access to healthy food. The co-op’s first member-owners began spreading the word and recruiting more member-owners. A marketing study was done that revealed the location at 6th and Junett as one that would be accessible to a large and diverse group of Tacoma residents. In early 2011 a membership drive brought many new member-owners. After this, the co-op board contacted each member-owner to raise the funds necessary to open the co-op. Finally, a General Manager with rich experience in the organic community was hired to open and run the store. 3. What can people do to help the Co-Op? Get in the habit of shopping at the co-op. Tell your friends about the co-op. Use our suggestion box (we listen). Become a member-owner. Volunteer to work at the co-op. Sign up for our email list. LIKE us on facebook. Buy co-op gift certificates. Come sit at our bar ($1 for a cup of coffee, fifty cents for tea, FREE WiFi). 4. Why is the Tacoma Food Co-Op important? We opened the Tacoma Food Co-op because our research showed that Tacoma residents had a strong desire for a co-op. Food co-ops are a different way of doing business, one focused on human need not human greed. The community owns, governs and benefits from the Tacoma Food Co-op – not some distant shareholders. Co-operatives are based on the values of self-help, self responsibility, democracy, equality, equity and solidarity. In the tradition of their founders, co-operative members believe in the ethical values of honesty, openness, social responsibility and caring for others. 5. What’s next for the Co-Op? More member-owners, lots of shoppers, great signage around the store, food/community education, deli food, and bike rack. A system that rewards member-owners with special deals, and outreach (such as events, farmers markets, and local organizations). This week’s 5 Question Friday is a guest post from Luke Byram. Luke has done a handful of these before and always finds interesting people. Here he is with Tacoma’s own Poet Laureate, Josie Turner. I first saw Josie Turner on CityLine talking about her recent appointment as Poet Laureate of Tacoma and her plans in that role. Without further ado… here is Josie Turner. 1. What do you most love about poetry, why? The poetic form allows the reader/listener to open the imagination. Poetry can make you laugh, cry, break your heart, bring the senses alive. It is what makes us human – that appreciation for the emotion. 2. What is your number one goal as Poet Laureate? I just want people to become more aware of poetry, to realize that poetry is not an abstract, but a living art form. People often think poetry was something written in the 19th century or even before and thus, because of the complexity of reading language we are not use to hearing, people think poetry is unapproachable or only cerebral. But poetry in its best contemporary form speaks to the human condition and its metaphor reaches the reader/listener in some deeper place of the soul. 3. What is your favorite type of poetry, why? I like good well written poems that speak to me. I don’t have a favorite type of poetry. I am open to all forms and love the discovery and appreciation of new poets. 4. Who is your favorite poet, why? I don’t have a favorite but am influenced by a wide range of poets. In the area, I have tremendous respect for Allen Braden, Marjorie Rommel, Rachel Dilworth, Kelli Agodon Russell, Kathleen Flinniken, Michael Magee… gosh there are so many. Casting a wider net, some of the more contemporary poets I continue to return to include Lola Haskins, Jane Kenyon, Robert Hass, Brenda Hillman, Mark Doty, WS Merwin. I was raised on the coast of California and never tire of Robinson Jeffers. We have a great press in Washington State – Copper Canyon in Port Townsend. I adore the various translations they have published and would recommend someone new to poetry to search their website for an interesting read. 5. 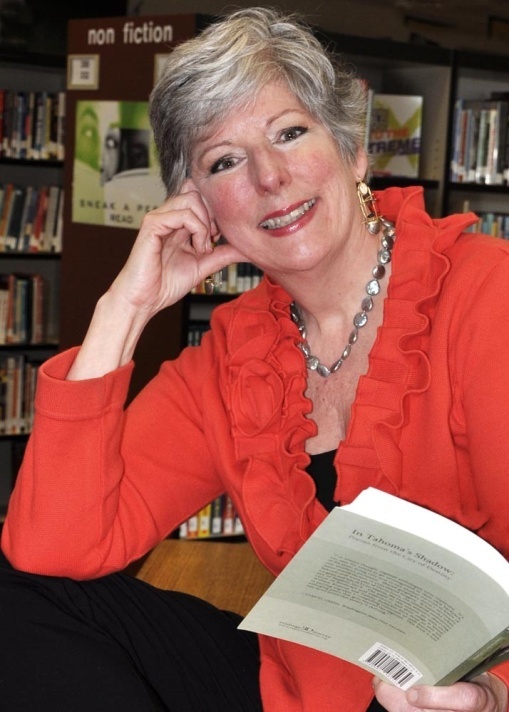 What are your plans for 2012 as Poet Laureate? There was a recent death in my family so I am a bit behind firming up plans for this year. That said, I plan to organize an activity around National Poetry Month in April and will be giving a couple of workshops – one in the spring and one in the fall. I have been invited to read at Fogdog Poetry in Arlington in October and am looking forward to that. In November, I hosted a reading by young poets at Kings Books. I am very interested in promoting the efforts of youth and providing opportunities for them to read so I will be organizing another couple of these events in the coming months. 5 Question Friday with ART BUS’ Angela Jossy! If you’re part of the art or business community in downtown Tacoma, you probably know Angela Jossy. A self-described ‘Duchess of Downtown’, she seems to work on more projects than any three people should take on. One of the more interesting projects she’s been involved with is the ART BUS. I managed to get Angela to take time out of her busy schedule to help me with the triumphant return of 5 Question Friday. Here she is. 1. What is ART BUS? ART BUS is a tour of art exhibits in the downtown vicinity of Tacoma WA. We do it every Third Thursday during Tacoma’s Art Walk. The cost is $10 to ride and $20 to be a VIP and get a gift bag with gift certificates and discounts to Tacoma businesses. 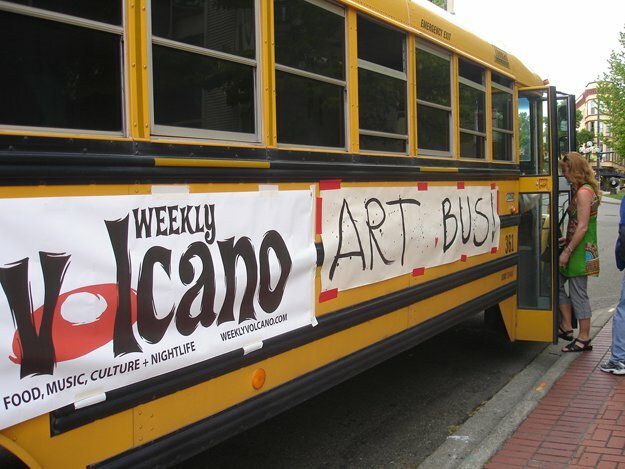 ART BUS is sponsored in part by The Weekly Volcano. Every month we have a different celebrity guest tour guide and we typically invite people who know a lot about Tacoma like city council members, arts commissioners, civic leaders, community leaders and etc. We also feature a different artist each month with our ART BUS buttons, which serve as the ticket to ride. 2. How did you get started with the ART BUS? ART BUS is an idea that we tossed around for a while because the galleries are really too far apart to actually walk to them during art walk. People used to joke around that it was really more of an art drive than an art walk. So in March of 2010 I decided to make it so and we’ve been rolling ever since! 3. Where in Tacoma is the most under-appreciated art location? ALL of Tacoma’s art locations are under-appreciated. A large percentage of people who live in Tacoma, let alone people outside the area, don’t even realize what an exciting art scene we have here. Far from being sedate and high brow, our art is exciting, inspiring and sometimes even shocking! This is not your Grandma’s art scene and its sprouting through everywhere – not just art galleries but restaurants, coffee shops, retail stores, vacant storefronts and even dentists offices! If you give them a wall or an empty space of any kind, Tacoma’s artists will give you something to talk about over the water cooler. 4. What other projects are you working on? I’m working on a fundraiser for the Go Red Campaign called the Love Squared Acoustic Dinner Party in February. I have a new blog I unveiled in December called the Duchess of Downtown Tacoma Blog. And I’m working on a 26-week cross-promotional project for small independent businesses because I feel the biggest impediment to people shopping local is know what to buy and where. So I’m going to use the most powerful mechanism at my disposal to change that – word of mouth advertising. I’m going to introduce people to the business owners, what they do, why they do it and how you can support them. Please find and friend me on Facebook if you’d like to hear more about that. I feel strongly that the one tangible thing that is within my power to do to help us politically, environmentally and economically is to support our local businesses. Remember, 75% of the money you spend at a local business stays and circulates in our community. 5. What’s next for the ART BUS? We just found out recently that ART BUS received a grant from the Tacoma Arts Commission. The way that grant works is you spend the money and they reimburse you so we are looking for a sponsor to match it. Then we can do more regional marketing, get a banner for the side of the bus, get a portable PA system and things like that to make it even better than it is already. Anyone interested in becoming a sponsor of ART BUS should contact me at angela.jossy@gmail.com. 5 Question Friday is a weekly feature at TacomaStories.com where I give a 5 Question Interview with someone in Tacoma. If you’d like to participate in 5 Question Friday or would like to suggest someone, email me at jackcameronis@gmail.com. Within the first twenty-four hours of 2012, Tacoma had its first homicide of the year. A month earlier, 25-year-old Michelle Davis had broken up with her boyfriend. Since that time, she’d told friends and relatives that he’d been stalking her. She was afraid enough that she stayed over at her sister’s house on East 84th and D Street on New Year’s Day. Around 11:30pm her ex-boyfriend got into the house and shot Michelle Davis while she slept. Michelle’s sister escaped through a window with a young child. Her sister’s boyfriend was shot eleven times and is currently in the hospital. Her ex then left the house. He was found in the school yard of Larchmont Elementary the next morning with a self inflicted gunshot wound. Tacoma’s East Side has always had its share of violence, but the truth is that this sort of thing can happen in any neighborhood. I don’t know the particulars of Michelle’s relationship with her ex. I know that volatile relationships are all too common regardless of who you are or where you live. Getting away from the situation is the best thing you can do. From the sounds of things, that’s exactly what Michelle was trying to do. In Seattle, on Christmas Eve, a school teacher was killed by her violent ex. These domestic homicides are becoming all too common. Sadly, there isn’t a lot to be done about it. Restraining orders won’t stop someone with homicidal urges from killing. They help get them arrested, but that’s about all they do. 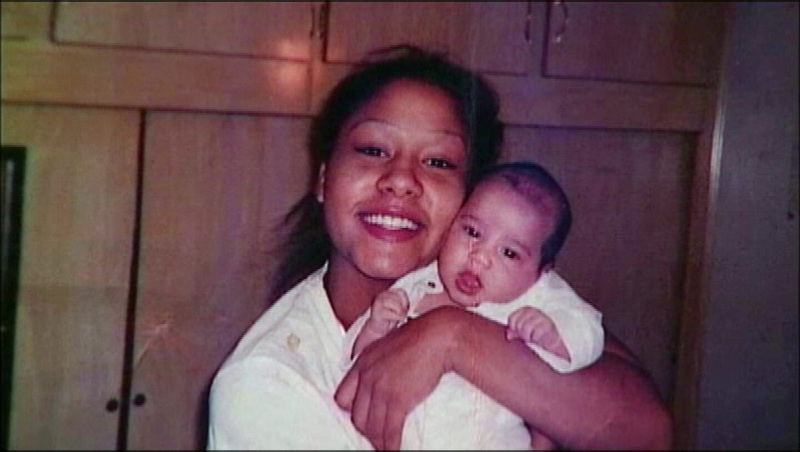 Relatives say that Michelle had an eight-year-old daughter, which makes this all the more tragic. As always, the comments section below is reserved for those who knew Michelle and want to post their memories or condolences.